The Frontier is happy to host Coding Kickstart, a complimentary workshop where you can get exposed to the basics of coding and walk away with a few new skills you may not have had before. If you identify as ‘code curious,' this beginner's program designed by The New York Code + Design Academy is right for you. Think of it as a way to dip your toes into the ocean of knowledge that a coding education can provide. Space is limited by room capacity. Must RSVP and have eventbrite ticket to attend. Please bring a laptop and your excitement to learn. 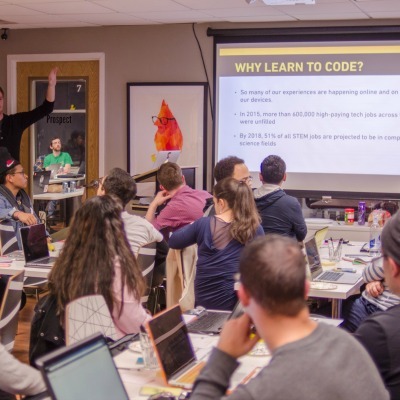 Learn to Code from 1:00-4:30pm and at the close of the workshop stay and sip a few free beers at the Frontier's Thursday Happy Hour from 4:30pm-6:30pm.